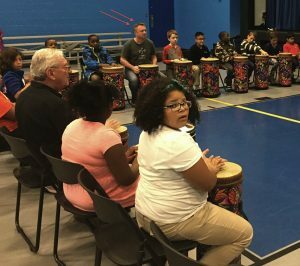 On November 2, 2016 we were surprised and delighted when Colin Currie, one of the world’s foremost percussion soloists, entered into the ROC Drummers’ rehearsal space at the David F. Gantt Community Center in Rochester, NY. Colin was in town for two performances as the featured soloist with the Rochester Philharmonic Orchestra in Jennifer Higdon’s Percussion Concerto. 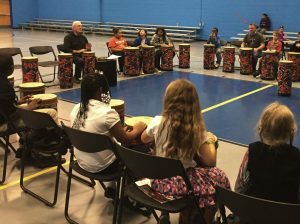 Colin performs regularly all over the world with leading symphony orchestras and conductors, so it was quite an honor that he would make time in his busy schedule to visit with our group of ROCmusic kids – all are enthusiastic novice hand drummers from the Rochester City Schools. Colin not only visited, but he and his friend Carol (a native of Brazil) joined in, and with lots of smiles drummed along through all three group sessions. Thanks, Colin! Your embracing of our group was inspiring to all who were there.